Look at my pretties! 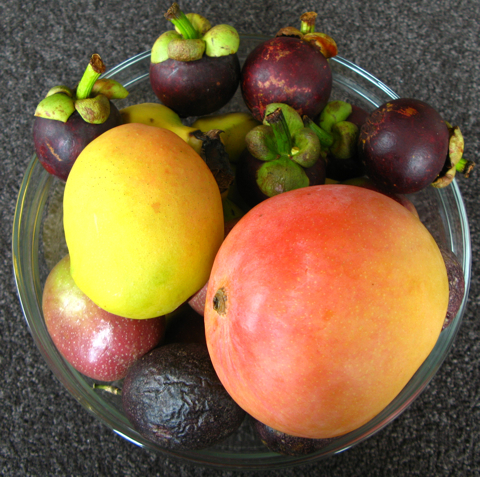 Two different kinds of mango and passionfruit, mangosteens, sugar bananas! I couldn’t figure out how to fit the yellow and white nectarines and the peaches into the bowl as well. Or the box of black cherries. Mmmm, summer home in Sydney. Happiness. Ain’t nothing else I want. I believe I’ll help myself to another mangosteen. Or am I in more of a peach mood? Or how about those rambutans? Decisions, decisions . . .
Posted in Cricket, Food, Sydney/Australia. Oh hai, mangosteenz how ai pine for thee! You truly have it hard. I am insanely jealous. As you know, getting good fruit in the States is impossible this time of year. Except for clementine tangerines – I have a crate of those right now. Mmmm. Winchester Grey: Mwahahahahah!! I eats them as I type!! Hundredz & hundredz of mangosteens. ALL MINE!!! Gabrielle: My life is misery and woe. E. Kristin Anderson: There is fabby fruit here in Sydney all year round. Hmmm, I should probably stop gloating. It is unbecoming. Ohhh, pretty fruit. You don’t see fruit like that here in the states.Especially during the winter. I like fruit, fruit is yummy and sweet. Most people haven;t even heard of or seen a rambutan or mangosteen. It’s sad really. But I love fruit. Woo! You need a bigger bowl! Lisa: Well, I would except I eated them all. Teehehehehe! Fruit! I’m jealous of your summer. IT’S COLD HERE.